"3 -2- 1, BLAST OFF!" Yesterday my son told me that we should get in a rocket ship and fly up in the sky to find the moon (it was a cloud covered night). So since we pretty much live in his imaginative world all of the time, I decided I would try to make that possible for him. I stopped by an appliance store's recycling bin (FREE) on my way home last night and made this rocket ship for my little astronaut. I've gotta tell you, we LOVE big cardboard boxes! When I was in junior high, I saw an episode of Out of the Box on Playhouse Disney (while babysitting, of course! ), and fell in love with cardboard boxes! I frequently dream of having my own preschool and having a whole closet full of broken down cardboard boxes so we can use them whenever and however we'd like. 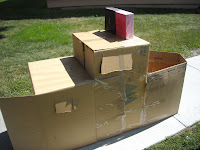 Earlier this summer, my nephew and I built a ship to sail the seven seas in! Seriously so fun and so cheap! 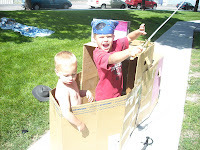 Next time you cross paths with a huge cardboard box, take it home and find a way to play with it! I just moved. I saved all my boxes in my side yard in the backyard. I'm letting the kids use them up, bit by bit. I'm LOVING it! We have 2 separate forts that have used up atleast 7 boxes each. One is even like a maze. So much fun. You are so right that there are so many things to do with a box. We love them!